This CD consists of recordings that were not included in the Gregory Corso "Die On Me" release. When Hal Willner, Marianne Faithfull, Rani Singh and myself went to Sherri Langerman’s home in January 01, we recorded about 14 hours of raw tape. After Hal and I finished "Die on Me", and particularly after it's virtual disappearance due to lack of effort by the original distributor, I went back to the tapes—knowing that there was more excellent material there. Despite Hal’s initial reaction, I put together this cd. And although this one has some rough edges—there’s just no way that I could let it sit. With the exception of the poem "ARMY", which was recorded live in Chigago in 1959, all the material on Lieders was recorded January 5, 6, and 7, 2001. Gregory died 10 days later. 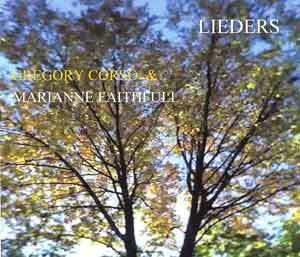 Lieders was a title he suggested for the original album and this release also contains more of the interaction and readings of the brilliant Marianne. The original sessions were produced by Hal Willner, Marianne Faithfull, and Michael Minzer. This release was produced by Michael Minzer and engineered by Jeff Mount at Goodnight Dallas Studio August 2006.